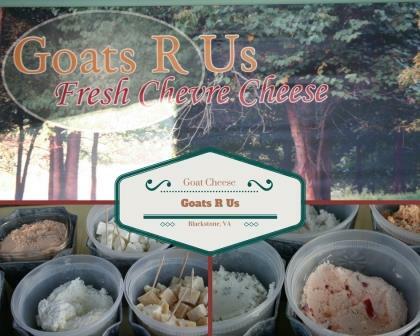 Goats “R” Us is a family owned and operated farm nestled in the southern Virginia county of Nottoway. Robin and John Dodson have produced farmstead cheeses for over a decade, including a soft cheese, feta, ricotta, camembert and their newest, a hard, aged cheese. Their cherished goats graze the 100 acre farmstead. Because of the rich butterfat, most of their goats are Nubian, but the Dodsons also milk LaMancha, Alpine and Saanen twice a day, with a January-March vacation. Made from scratch daily, Goats R Us products are ultra-fresh and may be stored in the freezer for up to six months without concern for loss of quality, texture, or flavor. Their cheeses are produced on the farm from milk to package in a facility inspected and licensed by the Virginia Department of Agriculture and Consumer Services. This guarantees optimum quality control of final products, every time. The Dodsons add various herbs to their soft cheese to create distinct flavors as well as dessert cheeses. Goats R Us promises a fresh product you will be happy to enjoy and pleased to serve.